Through an informal "talk show style" format, a panel of professionals in select industries will share their own career path, the inside scoop on what their jobs are really like, along with their perspective on what you can do to prepare for a career that interests you. This is your chance to ask questions, get valuable career information and take an action step in figuring out your own career direction. A tour of the host site will provided, with a special focus on seeing the latest technology and innovation happening in the workplace. Each month a new industry/segment/topic will be highlighted. 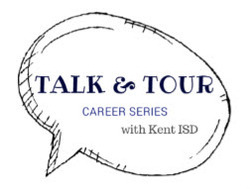 Parents/guardians are welcome to attend the Talk & Tour event with their student! All Talk & Tour events are scheduled from 6:00 PM - 7:30 PM unless otherwise specified. *Please note different start & end times for this event. Register here for the April 30, 2019 "Careers in Landscaping" event. Careers in Health Care - with 2 years or less of training! Register here for the May 7, 2019 "Careers in Health Care" event.